Sweet potato is a great alternative to white potatoes. Some people have learned to love the distinctive flavor over the sweet potato more than the milder flavor of the white potato. You can make a healthy version of French fries with sweet potato, you can serve sweet potato at a special occasion for a sweet touch or many other ideas. Here is how you can cook a sweet potato. It’s easy, quick and downright delicious. Read on for more information. Cook the sweet potato in the skin. Rinse it off well on the outside with cold waters. Use a sharp kitchen knife to cut off both ends of the potato. The oven needs to be preheated to about 400 degrees. Place the sweet potato on an ungreased baking sheet. If you don’t place them inside something, the natural sugar will leak onto the bottom of the oven and scorch. Back the sweet potato for approximately 40 minutes to an hour. Check to make sure they as soft as you want them before removing. 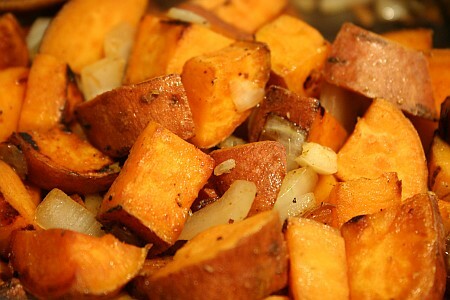 Roast the skinless sections of sweet potato with some chopped onion. They get baked at 400 degree in an oven for 40 minutes to an hour. Take some olive oil and apply to the sweet potatoes before you place them in the oven. Steam or boil the sweet potatoes but do not peel the skin off. Adjust the cooking time as needed. If the potatoes are large, more cooking time will be needed. The sections can be small and may only take about 45 minutes to soften. Whole potato may take up to a half an hour to completely cook. Here is a quick method to prepare sweet potato. You can leave the skin on for this or you can remove the skin. Wrap clear Seran wrap around the potato and stick it in several places to allow the heat to escape. Set the timer on the microwave to 10 to 15 minutes or until they are soft enough for you. Use a fork to smash sweet potato that has been cooked together with milk and margarine (or butter). Throw in some ginger, cloves, brown sugar or even cinnamon if you want. This is a nice little sweet pick me up for sweet potato lovers. There are different varieties of sweet potato. You will see the lighter versions a lot more frequently than the darker one. Either type can be used for all your recipes. The only difference is that the time needed to cook can change.